When we last left you, someone had thrown a lit flare onto The Scarlet Slipper, almost burning a hole in the deck. Nancy also found a threatening note warning her off the case. Clearly, someone is getting nervous about Nancy's investigation. 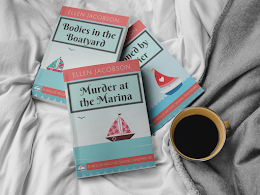 The next day, Nancy, George and Bess arrived at the marina and walked down to the slip where Marvin and Shelley’s boat, The Scarlet Slipper, was docked. Bess was sporting a new navy blue top with a sailboat embroidered on the front, white capri pants and had her long blonde hair tied back with a red scarf. Her cousin, George, was wearing khaki shorts and a simple t-shirt with her short black hair tucked under a sun hat. Nancy followed closely behind, looking immaculate in a kelly green cotton sweater set and madras Bermuda shorts. “That all sounds super,” said Nancy looking around the boat in anticipation of the three days they would be spending on the boat during the Grande Isle Regatta. “Girls, why don’t you tuck your bags in the v-berth for now and then come up and help us cast off,” said Shelley as she made her way up the ladder and into the cockpit. A few minutes later, Marvin started the engine while some friends on the dock untied their lines and helped them get off the dock. Marvin pointed the boat towards the inlet to the marina and steered them out into Pine Tree Bay. Nancy’s blue eyes sparkled as she looked around at the picturesque bay surrounded by rolling hills covered in pine trees. “Nancy, do you want to take a turn at the helm?” asked Marvin. Nancy smiled and said, “Sure, I’d love to!” Marvin showed Nancy which heading to take and moved aside so that she could grab the steering wheel in the cockpit. 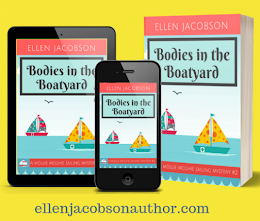 Nancy could feel the wind blowing through her hair as she pointed the boat towards their anchorage. As she looked around her enjoying the peaceful surroundings, she noticed a white catamaran coming up quickly on their starboard side. If the boat continued on its course, it was going to ram into them! “Look out Nancy!” shouted Marvin. “Quick, turn to port.” Nancy expertly steered The Scarlet Slipper out of harm’s way towards the western side of the bay. Tune in on Saturday for the next installment of Nancy Drew Investigates – H is for Ham Radio. When we were sailing in the Bahamas, we had to pay attention to the color of the water so that we didn't ground our boat. The water is so clear, and you can see right down to the bottom, that there were times I could have sworn that it was only a couple of feet deep, which would have been a problem as our draft is five feet. I would scream, like I imagine Bess would, "Scott, watch out, we're going to touch bottom!" But we didn't. It took a while, but eventually I got a little bit more comfortable with reading the water color. Just a little bit, mind you. It still freaks me out. Bess and I have a lot in common that way. I worry about grounding our boat and doing damage to it. What do you worry about? Yay - you've made my day! Thanks Anabel - I really appreciate all of your supportive comments! That is a nasty, nasty man who needs to be put in his place! What do I worry about? All sorts of things :) Book sales, if I can really do this writing thing, accidentally hurting someone's feelings - the list goes on. So much to worry about, but I admire people like you who take on writing seriously and publish books. That's something to be amazingly proud of! But what about the brownies and the sweet rolls down in the galley? And where is Bess? It's kind of a disappointing installment because Bess hasn't done anything monumentally stupid today. But, not to fear, we'll see Bess back to her usual nonsense in no time. Around here, temporary grounding is common as we have such high tide swings (sometimes as much as 10 feet). In racing, where one tries to avoid the currents by hugging the shore, sometimes the bet doesn't play off but thankfully the bottom is pretty soft. Our boat (a Moody 346) also comes in a bilge keel version which is really popular in the UK because it can be easily grounded on purpose. I remember my parents had a sailboat and I was learning to sail. The depth finder went to 99 feet then reset to 00. So 104 feet looked like 10 feet. I freaked and thought I was going to ground the sailboat. They sat back and had a good chuckle. That's exactly the type of thing that would freak me out too. When we were in the Bahamas last year, our depth finder kept playing up so I was never quite certain how deep that water was, which cause me more than a little stress at times. I could honestly see that as being a concern. My husband often talks about getting a boat and I would have to trust that he'd know to watch for dangers like this. I'd mostly worry about criminals out on the water, though. I know it isn't all that common, but I wouldn't spend the night on a houseboat out on the lake. I've probably watched one too many crime dramas! You always hear the horror stories about people being boarded and attacked with machetes etc. in the Caribbean, but in reality, the chances of it happening to you are really slim. It's just that the stories where people talk about how nothing happened to them that day are really boring. It's the dramatic ones that stick with us. This grounding didn't seem to have anything to do with Bess! She's getting a reprieve! We grounded our first sailboat about 3 minutes after leaving the dock. I've even managed to ground our dinghy in the Everglades. Ha! Hurricanes are my main worry. If it weren't for them, we'd stay in the Keys all summer; but I also don't think the Chesapeake is really "safe" from hurricanes. It's a problem! I decided Bess needed a bit of a break. Although, if she had been helming the boat, things would have gone really wrong. She would have ended up on the rocks somewhere. It's only thanks to Nancy's expert skills, that the catamaran didn't ram them and that they grounded in nice soft sand. I'm not sure anyplace is safe from hurricanes. They happen outside of the hurricane box, so where is it safe to be? We're just going with liability only insurance this year, so we won't have hurricane restrictions on us, but I still am not sure I want to be in the box or anywhere close to it. I'm thinking this dude on the catamaran is a little too aggressive, and needs some time in the brig to cool off! Ooh...a brig! I hadn't thought of that. If only I had, I could have worked it into the story. That would have been fun! This is so much fun, spending time with the best companions of my youth! Oh no there is something amiss here and that old man is in the middle of it. I hate running aground. High tide or low tide. Sometimes you just have to wait for high tide to set you free. Around here, my biggest concern isn't exactly grounding but hitting rocks -- they're everywhere! Ugh...that would make me a nervous wreck! That would be my fear in such waters. At least there you aren't in danger of hitting an iceberg, right? The people who commented right above you (SV Cambria) have sailed near glaciers. They have some amazing pictures of their boat anchored right next to them. It looks gorgeous, but I would worry that part of the glacier would break off and smash into my boat. The clear water and its colors in the Bahamas freaked us out initially as well! But, good lessons were learned for the rest of the world there. Tow Boat US is a must have is you're going to sail in these parts. Everyone I talk to or read about says it will save you tons of money in the long run, because everyone grounds around here. Poor Bess! I can so relate. The only way I could keep port and starboard straight is that port and left have four letters. You only have to remember one of them that way! Grounding is a common plot point in sea stories, isn't it? That is a new-to-me expression: If you haven't run aground, you haven't been around - but I like it. I think it can be applied to a lot more than just maritime circumstances. I love it when I'm entertained and educated all at the same time. This is a different world to mine! Thanks - glad I can keep it entertaining. Sailing stuff can be a bit dry at times. It must be amazing to look down to the bottom, see the fish. It would freak me out, too! I fear blizzards here in Minnesota, and icy roads. 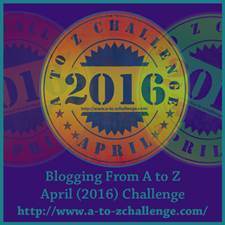 Thanks for visiting my blog during the challenge! I hate driving on icy roads! I'd rather stay inside all winter and wait for everything to thaw out before I venture out on the roads. I worry about accidentally letting an airhead like Bess aboard my boat! I think Bess might be my middle name. I can be quite the airhead at times. There is a very deep (100+ ft)inland lake about four road miles from me. In 1988 we had a bad drought, made worse on the lake by all the large lake-estate homes using lake water to water their massive lawns. We had a 19-foot ski boat and we actually tore up the bottom on rocks going around an island. It was a lesson learned. Oh no, that would have been awful! Was the boat salvageable? Yes, it was repaired. And then set on fire a year later. Exciting. Waiting to know what happens next. Are you sailing all the time, Ellen? Do you live on a boat? I worry about not achieving my goals as an author. That's the most common fear. I live on our current boat in southern Florida and we lived on our old boat in New Zealand for a while. Sadly, we're not out cruising just now due to my husband's work. We're planning on heading back out to the Bahamas next season and then down to the Caribbean. I worry about many things, and I'm trying to learn to worry less. Now that I know what grounding is, I think I'd worry about that too if I had a boat!